I have been on my own for three weeks. Regulars to this blog will know that both my kids are half way across the world in Vancouver at university. My husband Doug has been in Malaysia for three weeks on business. I realized the other day that we are equally dispersed around the world in terms of time zones – the girls are currently 8 hours behind me, I am 8 hours behind Doug and he is 8 hours behind the girls. This makes for difficulties in communication. There is also the related problem that among the family members, all of whom are frequently called upon to be blog photographer, I am probably the least skilled in this arena. Thus the top photo, which as you see, has a shadow falling across the sweater. Sorry, Emma, I know this is not up to your standards! One of the very cute features of this sweater is that the front is knit in a tiny lace stitch and the rest is knit in stockinette. 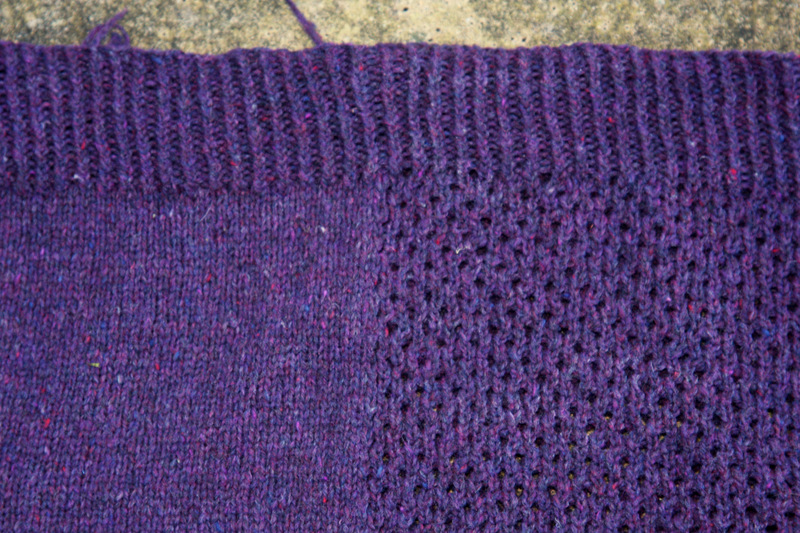 Above is a photo of the side ‘seam’ (of course there is no actual seam as it is knit in the round). Isn’t it lovely? 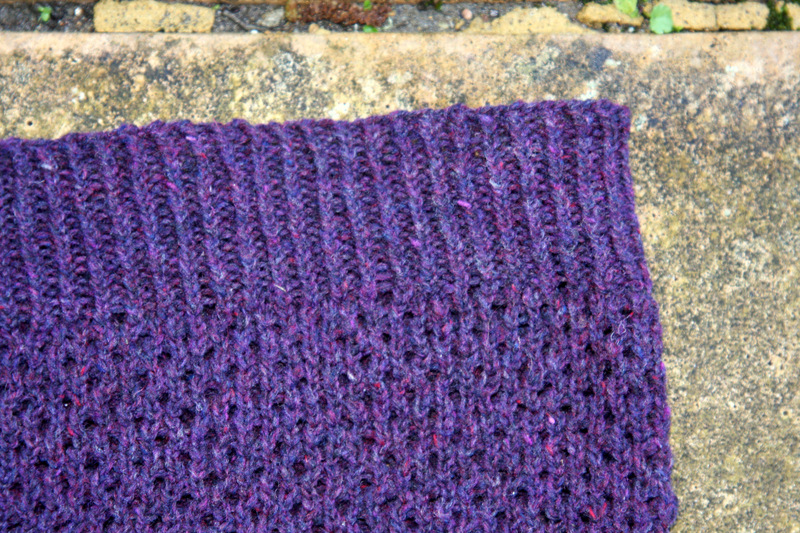 It is such a cute pattern and so easy and intuitive to knit. I also love the flecks of colour in the Loft. 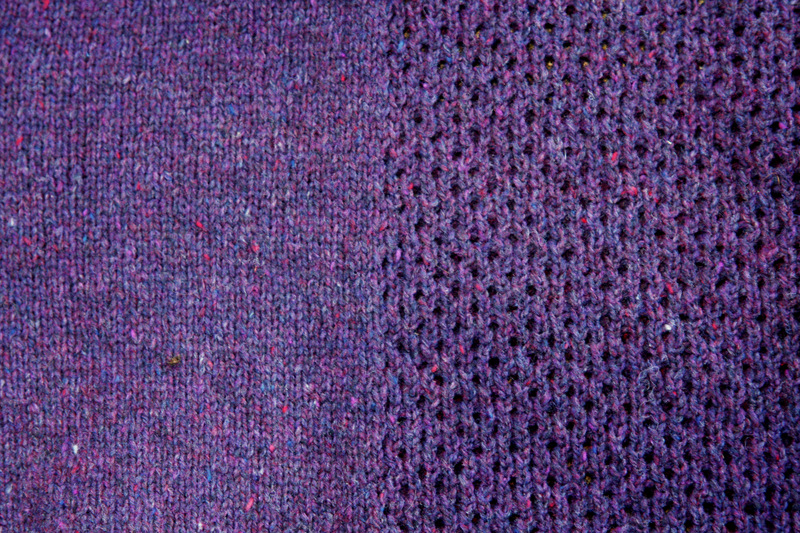 This purple-y colour is called Plume and it has lovely flecks of reds and blues. 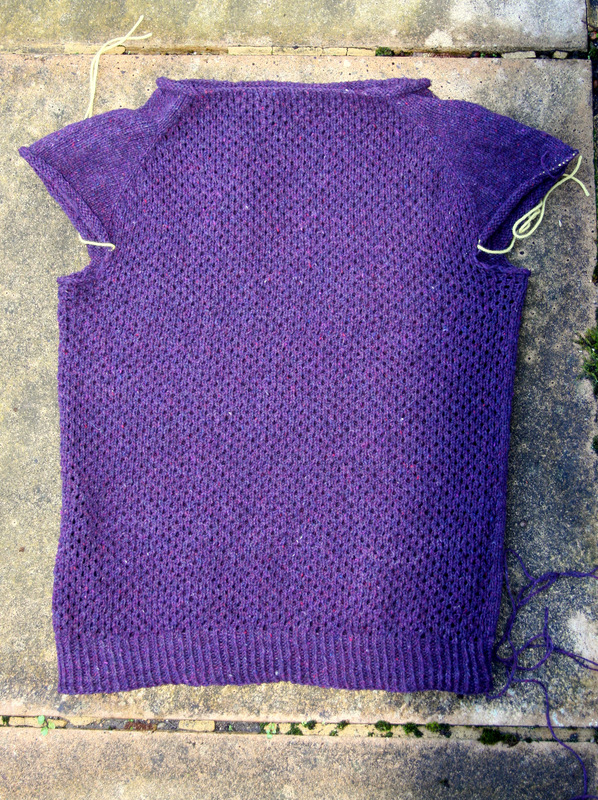 Now, all I have left is the sleeves and some very minimal finishing at the neckline. First, however, I need to wind another skein. My plan is to drape it over my knees and wind it by hand. Having done this before in times of emergency, I can tell you that it involves a fair amount of contortion and looks rather silly. Good thing there’s no one around to take a photo! This entry was posted in Main and tagged Brooklyn Tweed Loft, Carol Feller, Carpino, Knitting by knitigatingcircumstances. Bookmark the permalink. love teh yarn and sweater. I believe you that it fits beautifully, but I hope someone comes along to take your photo soon! Thank you. I’ve tried the chair solution in the past, but I miss the camaraderie. yeah, a chair just isn’t the same as a person for conversation! I recently passed my swift and ball winder on to others because my new apartment is too small to set them up. But I’m way too impatient to wind the yarn by hand before I start knitting, so my solution is to wear the skein like a necklace while I knit, then very carefully re-twist it when I’m done for the night. This only works with small-ish skeins, though. I tried it with some Cascade Eco recently and it all went horribly wrong. Your sweater’s looking great! Can’t wait to see the modeled shots. Not having a photographer around is tough when you’ve got a project you want to show off. Hey, that’s a new one to me. And it has the added advantage of keeping you warm while you knit! Love it- love the sweater, love the yarn. Looking forward to seeing it modeled. The trick is to bribe them, Dawn! Great post! Beautiful pattern! Lovely yarn! Super work! When I was growing up we used to put the skeins round the top of the uprights of the back of a dining chair. Unfortunately the ones we have now are rounded at the top . . .
Lovely sweater and colour. I also use the back of a chair to wind yarn or even put the skein around a very large pillow. I haven’t heard of the pillow method before! Next time I will wind lots of yarn before Doug goes away. Get thee a swift and ball winder. I bought mine on Knit Picks, and while I’m very satisfied with the swift (oak, made in Italy, nice workmanship), the ball winder will be replaced by the gold-standard “Royal” model once the KP version bites the dust. If I win the lottery, I’ll buy both of us Nancy’s Knit Knacks Heavy-Duty Ball Winder! My LYS just bought this model, and it makes you want to wind every one of your skeins into cakes!